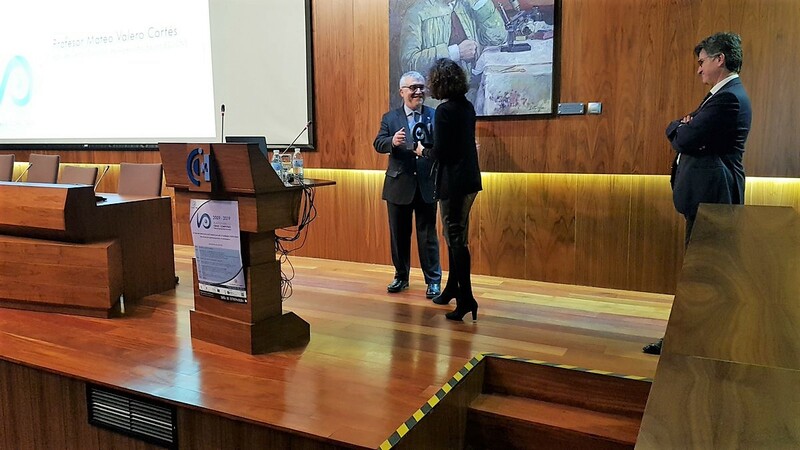 The Extremadura Center for Research, Technological Innovation and Supercomputing rewards the director of the BSC during the commemoration of its 10th Anniversary. The director of the Barcelona Supercomputing Center (BSC), Mateo Valero, has received today the prize Research Excellence of CénitS (Extremadura Center for Research, Technological Innovation and Supercomputing). The awards ceremony took place in the framework of the commemorative act of the 10th Anniversary of the creation of CénitS by the Computaex Foundation (Computing and Advanced Technologies Foundation of Extremadura). CénitS manages the Lusitania supercomputer, one of the nodes of the Spanish Supercomputing Network (RES), which is coordinated by BSC. Mateo Valero received the award from Olga García García, President of the COMPUTAEX Foundation and Minister of Economy and Infrastructure of the Government of Extremadura. During the event, Valero also offered the conference "BSC and what supercomputing can do for us".